Home > Moving Guides > Home Improvement 101 > Home Improvement 101 > What Home Improvements are Tax Deductible? Home improvements can benefit your home for years to come, but it can get pricey pretty fast. The average cost for remodeling a bathroom is $9,700. Redoing a kitchen is not better, costing $22,300 on average. Not many have that kind of money lying around and will spend years -- even decades -- saving up for it. It would be nice to get a tax break from Uncle Sam on those home improvements. 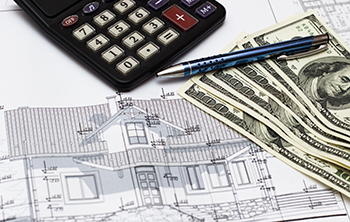 Home improvements are not always tax deductible because the IRS considers them personal expenses. Fortunately, there are exceptions to this rule. While you can benefit from certain deductions in the years you buy and sell your home, there are tax deductible home improvements you can take advantage of while residing in your house. Is my home office tax deductible? If you are regularly using, or plan to use your home to conduct business, you might be able to deduct home office related expenses. The IRS classifies home office expenses as direct, indirect or unrelated. For example, if you're painting your entire 1,500 square-foot home, including your 150 square-foot home office, about 10% of the expenses are tax deductible. Can I write off energy efficiency upgrades? If you have a home office or manage a business on your residential property, the energy efficient upgrades to your home count as an indirect deductible. This can save you a significant amount of money come tax season. Back in 2017, there were federal tax credits for energy efficient home upgrades. These were the Residential Energy Property Credit and the Nonbusiness Energy Property Credit. Those have since expired, but many states offer tax incentives, such as sales or property tax exemptions for the purchase or installation of certain equipment. One of the biggest energy tax deductions available through 2019 is the solar investment tax. This applies to solar panel and solar water systems, and could be worth 30% of the cost of the equipment, labor and installation. Are medical home improvements tax deductible? These expenses cannot add any value to your home. In fact, in order to qualify, you must factor the cost of the improvements and reduce it by the amount it increases the value of your property. Otherwise, it cannot be deducted. Can I write off home repairs on my taxes? First off, it's important to know, for tax purposes, the difference between a home improvement and a home repair. A home improvement increases the value of a home, or makes it more useful than it was before. Some examples include a new roof installation, new foundation, or a new heating system. A home repair keeps your home in working condition, but doesn't make it better than it was before. Examples include repainting, fixing leaks, or replacing broken windows. The only way a repair can be deemed deductible is if it is part of a repair for your qualified home office or if you are renting out that part of the home. Can I write off homeowners insurance on my taxes? Most costs related to homeowners insurance are not tax deductible, including the insurance premium as well as any property losses. There are a few exceptions, however. If you use part of your home for operating a business, that percentage of your homeowners insurance can be written off. Homeowners insurance can also be tax deductible if your property is used almost entirely as a rental. Is my homeowners association fee tax deductible? HOA dues are typically not tax deductible. However, you can claim or write off a percentage of the fees if a portion of your HOA dues go to something that you could deduct if you paid it yourself. If your HOA owns the land surrounding your development, it would be responsible for paying the property taxes on that land. You could then deduct the amount of your HOA dues that relate to the property taxes you pay for. Furthermore, if you have a home office, you can write off the percentage of all your home's expenses that you utilize as your workspace in your home. This includes writing off a piece of your homeowners association payments. If part your home is used as a rental, you can write off the percentage of operating expenses that the space takes up within your home, including HOA dues. For example, if the rental space makes up 15 percent of your house, you can write off 15 percent of everything you spend on your home, including HOA fees. The only settlement or closing costs that are tax deductible is your mortgage interest. Keep in mind that these payments can only be deducted the year you buy your home, and if your deductions have been itemized. The amount you are allowed to deduct depends on factors such as the date of the mortgage, the amount of the mortgage and how the proceeds of the mortgage are used. A deduction on mortgage interest can also be taken on loans for second homes and vacation homes, with certain limitations. What is the Federal Home Improvement Loan Program? Offered by the Department of Housing and Urban Development, the Federal Home Improvement Loan Program helps low and medium-income households pay for their home improvements. One thing to keep in mind is that these improvements must be more substantial than minor repairs or improvements. If you need to replace your roof, siding or make structural repairs, then this loan program is a viable option. Rate this guide What Home Improvements are Tax Deductible?